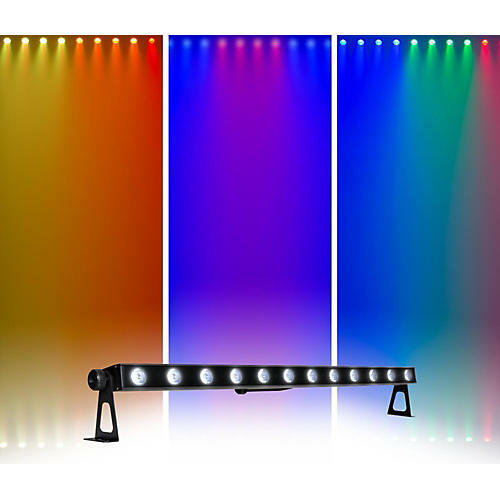 The VENUE TriStrip3Z color batten stage light from Venue combines spectacular brightness, vibrant colors, extreme durability, and flexible operation in a thin batten that is perfect for uplighting effects, cyclorama and focused-down lighting applications. VENUE TriStrip3Z features twelve 3-watt tri-color LEDs with VENUE’s LED technology stabilizes temperature fluctuations, allowing your new fixture to retain premium performance and brightness over time. That means your show will look just as good at the finish as it did at the start. The VENUE TriStrip3Z is organized on three zones for maximum color options. Each LED features dual-stage optics housed in a robust chassis with clear protective lens and includes has four operating modes (Stand-alone, Sound Active, DMX, and Master /Slave), seven static colors, 236 color macros, 14 preset color programs, strobe, dimming, and manual color mixing. The VENUE TriStrip3Z is constructed with sturdy adjustable feet, multiple hang points for precise aiming from stands, trusses, and floors. It also includes pass-thru DMX and AC connections for neat cable management. The VENUE TriStrip3Z integrates seamlessly with ThinTri38LED and ThinTri64LED using the Control16 DMX controller for complete scalability for large and small shows.